So the news was not correct, we have checked officially! A few days ago, a local website published an article about Daraz.pk being acquired by Alibaba. They even sponsored it on Facebook to increase reach. A combination of the news being plausible, considering months of speculation, and excitement (or dismay depending on your point of view), meant that everyone started sharing the information. In the last day, tons of no-name sites have also started regurgitating the same news and are peddling it as truth. However, we’d like to set the record straight. 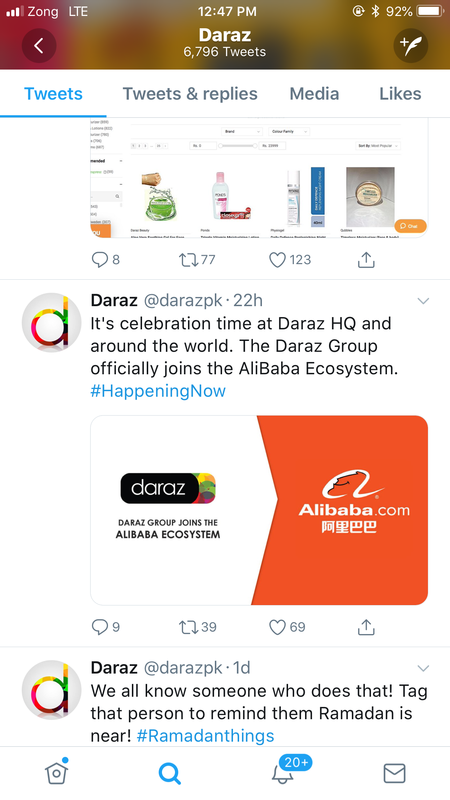 According to our sources, Daraz definitely hasn’t been acquired by Alibaba – yet. We can confirm that talks are taking place between Alibaba Group, Telenor Bank and Daraz. Alibaba officials have been regularly visiting Pakistan over the last few months and are in advanced stages of discussion with a few key people but there is no confirmed deal yet. Alibaba has also been in touch with the government and has promised as much as $400 million investment in Pakistan. However, the ecommerce giant hasn’t stated anything about either the nature of this investment or its time frame. Daraz na hogya, mawra hussain hogai..
Daraz affiliate is not responding since 2 months and they owe me 21,000 rs. Daraz really needs to fix their dealing with affiliates and sellers, and ensure that affiliates and sellers are not carrying all of the losses that are created due to their inefficient system. Creating a value driven ecosystem is different than creating a rip-off culture for short term revenue figures. Sadly, it is the later that is at play. Not surprising because the same team that was behind Kaymu is behind Daraz — Kaymu was all about ripping off the customer whereas Daraz is all about ripping off the affiliate and seller. What’s the update on this? https://uploads.disquscdn.com/images/b4fb5363e82c0b8728eca17303dd7c4354c1efe6f1a1bf791417570619b7218f.png How about theri official tweet? ?